Please Note: Penhow Castle is privately owned and is no longer open to the public. A perfect example of the smaller type of fortified manor house, Penhow was developed from a heavily-built keep necessary to protect the knightly retainers of the local earl, who lived in almost impregnable majesty at nearby Chepstow Castle. This great Norman stronghold and bridgehead into Wales was the first castle with a stone keep to be built in Britain by the conquering Normans in 1070. "Knight's Fee" manors and castles like Penhow were established to protect the outlying farmlands and give advance warning of any Welsh uprising. 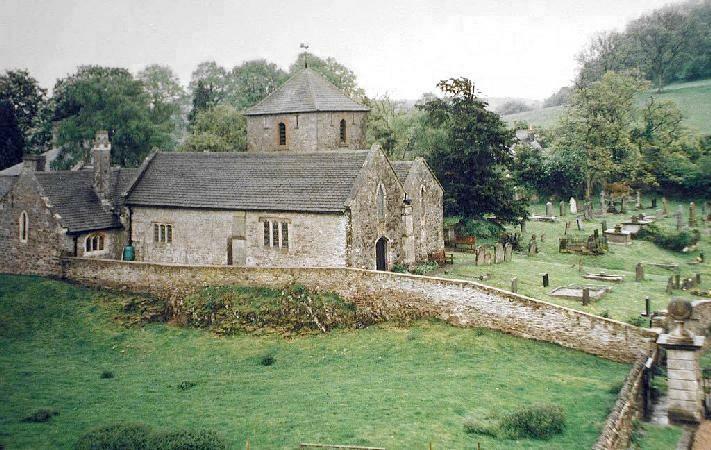 The area that is now known as Gwent was settled by families that had come over from France with or in the wake of William the Conqueror, and we know that Sir Roger de St Maur was at Penhow by 1129, for he witnessed the charter that founded the priory of Monmouth in that year. In return for the task of keeping down the Welsh, providing a quota of men for guard duty at Chepstow every month, and for supplying one man mounted on a horse in times of War, Sir Roger was permitted to usurp the Manor of Penhow from its native Welsh prince, and gain a toehold on the feudal ladder. 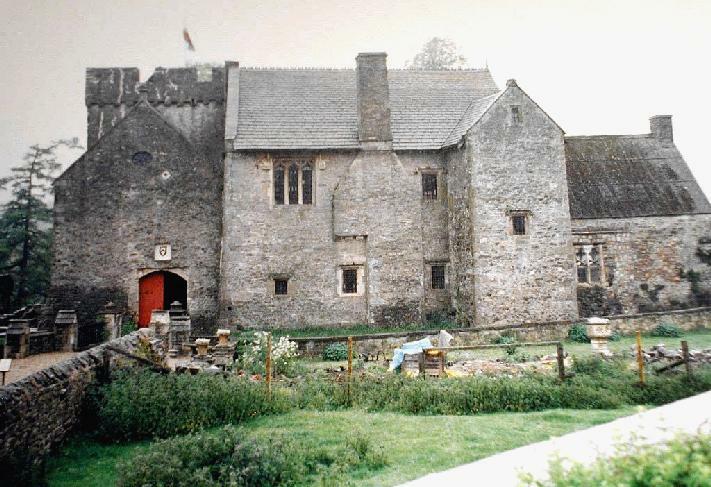 Sir Roger's home was a cold stone Pele tower that stood alone on its rocky knoll, and directly overlooked the conquered natives in their 'Welshry' at Talgarth. It was the first home in Britain of a family destined to become one of the greatest in the land. But it was more than a century after the foundation of the castle before the fortunes of the St Maurs - or Seymours as they came to be called - really began to prosper. By the mid 13th century the great marcher lordship of Chepstow was in the hands of the powerful Marshal family, who were also the earls of Pembroke. Penhow's then seigneur, Sir William de St Maur, had married the 3rd daughter of the earl of Pembroke, and in 1240 entered into a nefarious agreement with Gilbert Marshal, his overlord and brother-in-law, to deprive Morgan ap Howell, the last prince of Gwent, of his manor at 'Woundy', four miles from Penhow and now called Undy. The agreement still exists in the public records office in London, and provides that if there was any resistance to this 'annexation' of Woundy, St Maur could call on the might of Marshal's army. For St Maur's presumption and Marshal's backing, the two divided the proceeds of the manor between them. In the later documents the St Maurs are recorded as having the vineyards of Woundy, and in that village today there is still a Vinegar Hill, which presumedly marks their site. When the castle moat was re-excavated by University College Cardiff in 1978-9, a number of circular sling-shot stones were recovered from the 13th century layers. Perhaps they were thrown at the castle by the angered citizens of Woundy in 1240. But if so, it could only have been a futile protest, for within a generation all Welsh claims to the manors had been extinguished. While the cadet branch of the family had moved to green pastures in Wiltshire, the senior branch found itself by the end of the 14th century without a male heir, and Isabella Seymour married one John Bowles, who died in 1430. The Bowles of Penhow adopted the arms of the Seymour family, the simple paired wings of the hunting lure, and in 1438 Thomas Bowles, John's grandson, led a small force of men from Penhow all the way to Berwick-upon-Tweed on the Scottish border to assist in the siege of the town. The siege was part of the complicated politics of the War of the Roses. For his services, Thomas Bowels was knighted by the Duke of Gloucester and returned to Penhow with a substantial pension. 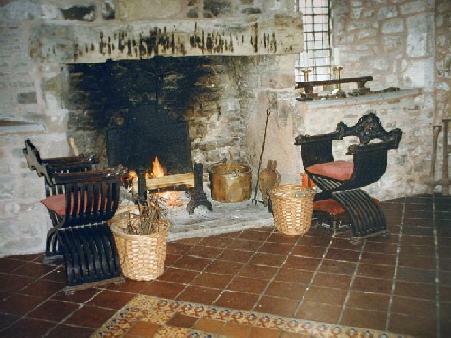 He then married Maud, daughter of Sir Thomas Morgan of nearby Pencoed Castle. His arms, the paired wings, and hers, the griffin or dragon of the Morgans, are carved in stone on the outside of one of the windows of the great hall. Sir Thomas's son produced an only daughter, Maria, who married Sir George Somerset, brother of the 2nd earl of Worcester, Lord of Raglan Castle. In 1674 Thomas Lewis of St Pierre, a grand estate near Chepstow, bought the castle. His son was High Sheriff of the County, and in him the refurbished Penhow Castle had a resident Lord of the Manor for the last time until the lordship of the manor was conveyed back to Stephen Weeks in 1979. Of what happened to Penhow during the Civil War that preceded the Lewis' ownership, very little is known, however it appears to have survived as a habitation, unlike almost every other castle in Monmouthshire. By 1714 the castle was owned by absentee landlords, and it was tenanted as a farm, remaining that way until 1966 under a variety of owners. 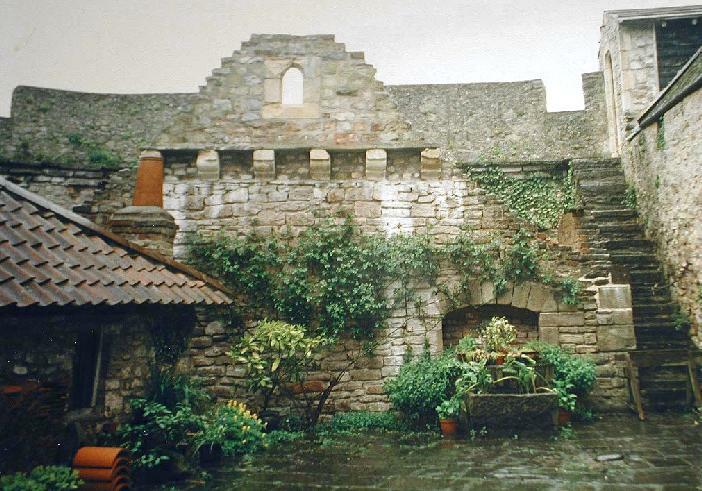 In 1973 the castle was sold to Stephen Weeks, a young film director and writer, who began the full-scale restoration of the castle. By 1978, having suffered arctic winters with the roof off and all the usual privations of restoring a building while living in it, he had completed enough of the castle to allow visitors, and work on the restoration continues to this day. Less than a century after the keep tower was built, the larger area of the inner bailey was enclosed within a thick stone curtain wall, provided with a wall-walks, battlements and look-outs. One of the look-outs is visible from the courtyard. By the 14th century Penhow was quite a stronghold. The drawbridge which traversed the moat was operated by counterweights of stone and flanked by a strong square guard tower (rediscovered in 1979) and by the projecting wall of the great hall block. 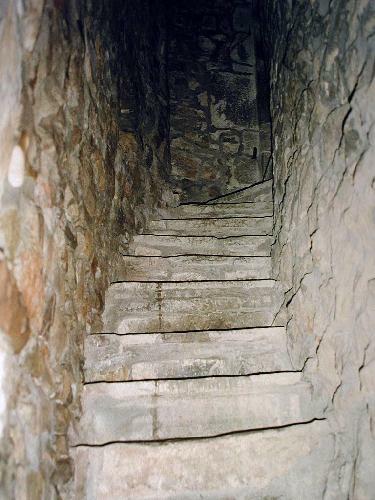 Inside the bailey was a series of structures, the lower portions of which are incorporated into the present buildings. On the east was an undercroft (excavated in 1979), which was used as a wine store. The north range has now been absorbed into later buildings, and it is impossible to determine its medieval functions. 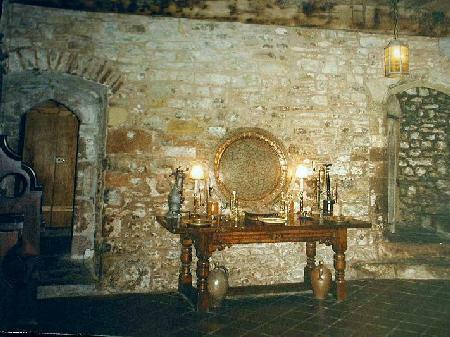 The south range contained the hall, lower than the level of the present great hall, and narrower. The lower hall, now the entrance hall to the castle, was probably used as a retainer's hall in the time of Sir Thomas Bowles, and adjoining it was the tiny Porter's Room, which overlooked the drawbridge and which had a stout barred door to contain the castle's valuables. Above the lower hall, and reached by a spiral staircase, is the Great Hall, which achieved its present shape in the late 1480s. At one end is the screens passage, with a minstrel's gallery above. 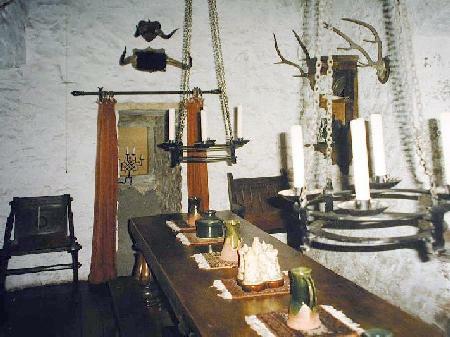 The north range displays the work of the Lewis family in converting Penhow from an old-fashioned castle to a modern house shortly after 1674. The north side of the curtain wall was pierced for large windows and an impressive front door. Penhow Castle gives us a fascinating look at a smaller-type medieval fortification once numerous throughout Wales, and provides insight into the way the British house has developed over the centuries.